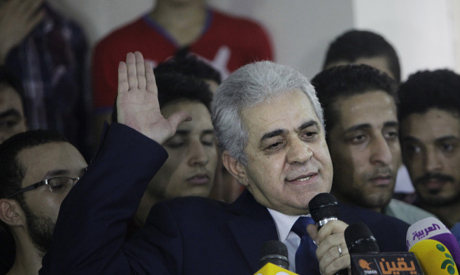 Leftist politician Hamdeen Sabahi accepted his defeat in Egypt's 2014 presidential election against former military chief Abdel-Fattah El-Sisi – yet still took aim at the electoral process, arguing that a host of alleged violations prevent any claims of "credibility". Speaking at a press conference on Thursday evening, a day after voting commenced, Sabahi told reporters and his supporters that he will not accept any post in the coming government but will instead bring the same values and plans from his campaign to the country's political opposition. Unofficial results indicated the Nasserite politician garnered a humble 3.5 percent of the vote, with less than 800,000 ballots cast in his favour. His contender, El-Sisi, won a landslide victory of over 96 percent of valid votes, with over 23 million voters casting their ballots for him. Invalid votes – or spoilt ballots – exceeded 1 million, higher than the votes for Sabahi. Turnout was around 47 percent. "It is time to respect the people's choice and admit my loss," Sabahi said in the press conference at his campaign's head office in Cairo. "We lost the election but won our respect for ourselves … we lost one battle but we have faith in victory for the people's dreams of bread, freedom and social justice at the end of the path." He added that he will work on forming a civilian democratic alternative that will keep on fighting for democracy, social justice and freedom – cornerstones of the 2011 revolution. Despite the conciliatory tone, Sabahi still spoke of several violations that he says his campaign faced during the election – including his campaign representatives being restricted, attacked and detained, as well as suspicions of forgery and El-Sisi's representatives being allowed to campaign inside polling stations. Sabahi also took issue with the third day of voting, Wednesday, that was suddenly tacked onto the election by the Presidential Elections Commission (PEC) near the end of voting on Tuesday. His campaign – and El-Sisi's – filed a formal complaint against the PEC's decision, which was later rejected. He mentioned other reports from campaign representatives of ballots cast in his favour not even being counted at polling centres, with he being granted zero votes automatically. "We cannot give any credibility or ratification to the announced numbers of turnout or results," he said. "The announced results are an insult to the intelligence of the Egyptians." He believed, however, that these violations did not affect the final results and that he accepts them, "despite defects." Sabahi also criticised what he called "not enough fairness and objectivity" from state institutions and media "choosing to mobilise people and not to make them aware." "We have chosen, with a full awareness of the challenges, to lead the battle. We did not run away from our duty of presenting the alternative that represents people's dreams … digging a democratic path for the freedom of choice," he said on the podium, followed by cheers and clapping from his supporters. He saluted his campaigners, who he said proved they could do more than getting to the streets and competing, "even in unequal elections." Sabahi had been critical of the process all along. First he took issue with the issuing of an election law before the vote which elevated the high elections commission above judicial review, thereby eliminating any chance of appeals. He then denounced assaults against his campaigners during the campaigning period and finally was outspoken in the media over apparent violations during voting and the PEC's decision to extend the election, which other critics also argued was an attempt to boost turnout and El-Sisi's votes. "We were morally assassinated," he said. In protest, he withdrew his representatives from polling centres – "for their safety" – but refused to withdraw from the election altogether, despite pressure on him to do so, claiming that he was sticking it out "for the benefit of the country." From afar - Ottawa, Canada - I have been closely following the elections in my homeland. Disappointing yet very much expected results were a total let-down. I wish to express my respect and admiration to Mr. Sabahi- Bravo. We certainly need more people like you during these troubled times in Egypt. Wishing you all the best and good luck for next time around!!! Without his, highly respectable and worthy solitaire running Egypt's 2014 presidential election woudn't even have been possible. Out of love for his country he took upon himself the risk of the outcome, just to get Egypt out of its deep present trouble. With this, and the other candidate literally risking his life all along, these were maybe history's most lovable elections, in any case the conditions were quite exceptional. I very much aooreciated both candidates too for their fair way to speak about each other, with el-Sisi noting "Sabahi thinks he's useful for Egypt and that's a positive thing" and Sabahi saying if he'd win he'd take care nobody could harm el-Sisi. This inmidst of the campaign, really beautiful. All should be very thankful to Sabahi, for what he did and what he's planning to do in the future. As for the complaints PEC'll certainly see into them, especially if votes even weren't counted. Retrospectively, to create a PEC with so much power maybe not so bad an idea? The winner and loser is Gen CC not Sabahi.Yes hats off to Sabhahi for taking part in election despite of the fact that all state organs,including Army,judiciary,media,police,PEC were behind CC but his brave decision to part despite all these challenges finally shattered the IDOL that was built by media.Sabahi not only shattered the fale image of CC created by media, he also exposed the media in day light.The world watched the frustration of the Egyptian media when they couldn't find people in the polling station in 03 days of elections. Congratulation Sabahi for showing the real face of the media and CC regime. Sabahi you are the real hero. I salute you. I voted for el sisi because the nation needs the military to rebuild it quickly. However you have more of my respect than him. You are a hero of democracy. I pray to God you reach the highest of positions. Keep up the amazing work. Rabena yewaf2ak. Don't dwell on your loss Hamdeen, Egyptians lack accepting reality and moving on gracefully. Hope he will come to his seances, as Egypt needs all of its NON radical extremists to build Egypt to its past glory. All Egyptians need to overcome the damage done by the brotherhood terrorists. the are no losers. You should be the Vice President to travel and advise our national hero of the real suffering and solution to our population explosion. Allah Akber.